Dr. Sasha Noe, osteopathic physician and owner of Apollo Beach Family Medical Care, has introduced Direct Family Care to take the “middle men” out of the doctor/patient relationship and provide patients with comprehensive, high-quality and low-cost primary care. Some of us remember a time when going to the family doctor was like visiting an old friend. The physician always took plenty of time to get to know us personally, welcomed our questions and developed a treatment plan based on what he or she felt best. Thanks to the big insurance companies and governmental regulation, that’s just not the case anymore. But Dr. Sasha Noe, a board certified osteopathic family physician and owner of Apollo Beach Family Medical Care, is now offering Direct Family Care to take these “middle men” out of the doctor/patient relationship and provide patients with comprehensive, high-quality and low-cost primary care. “Our focus is to remove the barriers to patient care that aggravate patients and interrupt my ability as their physician to provide continuous, preventative care so patients can achieve their best health possible,” Noe said. “This is best served by our Direct Family Care plan. “I have patients who have health insurance who still can’t get the healthcare they need,” Noe continued. “They’re not only paying high premiums, but they also have high deductibles and out-of-pocket expenses. For most people, health insurance is essentially a catastrophic policy, which due to what Noe called “enormously high deductibles” prevents them from getting routine primary care. Noe said individuals who will benefit most from Direct Family Care are those wanting affordable access to a family doctor without the hassles of an insurance company. Insurance-based medical care is problematic for both the doctor and patient. “My doctor-patient relationship has a third party in it,” Noe said. “I’m not able to provide the care my patients need in the purest of manners. My hands are tied with set protocols from insurance companies when it comes to certain treatments. Patients on Noe’s insurance-free program commit to pay an age-based, set monthly fee for 12 months to receive highly personalized, direct medical care; same-day scheduling; no wait time; and after-hours access for urgent healthcare needs. They get the doctor’s personal number to call or text her. They and Noe determine all healthcare decisions, not an insurance company. “While Medicare-eligible patients cannot qualify for the Direct Family Care plan, we will continue to accept Medicare insurance to accommodate patients at this time,” Noe said. The Direct Family Care fee includes 25 office or telemedicine visits; annual wellness exams; basic office procedures; in-office testing; and treatment of acute illness. Patients on the program also have access to self-pay pricing for lab and imaging services negotiated locally “for a fraction of the cost they would pay if an insurance policy was involved,” Noe said. The doctor added that Direct Family Care can also be an ideal way for small businesses to provide healthcare benefits to their employees at low monthly rates. Employers are encouraged to call 813-641-0007 for details. “I’m the first and only Direct Family Care physician in southern (and eastern) Hillsborough County,” said Noe. “I love taking care of my patients. It’s my calling, my passion. Noe, 44, opened her Apollo Beach practice in September 2012, after completing her residency at St. Petersburg General Hospital. She is board-certified in Family Medicine and Osteopathic Manipulative Treatment. When she was 17, she moved from Trinidad to the United States to attend Palm Beach Atlantic University in West Palm Beach and received its Distinguished Alumni Award in 2014. She graduated in 1994 with a bachelor of science degree in biology, and then went on to earn master’s and doctorate degrees in medical microbiology and immunology from the University of South Florida College of Medicine. After graduate school, Noe worked as the faculty director and science instructor for the Saint Leo University Center for Online Learning. After several years in academia, she took some time off to raise her two children and help with her husband’s business before deciding to follow her true passion — medicine. In 2009 she graduated from Lake Erie College of Osteopathic Medicine in Bradenton. 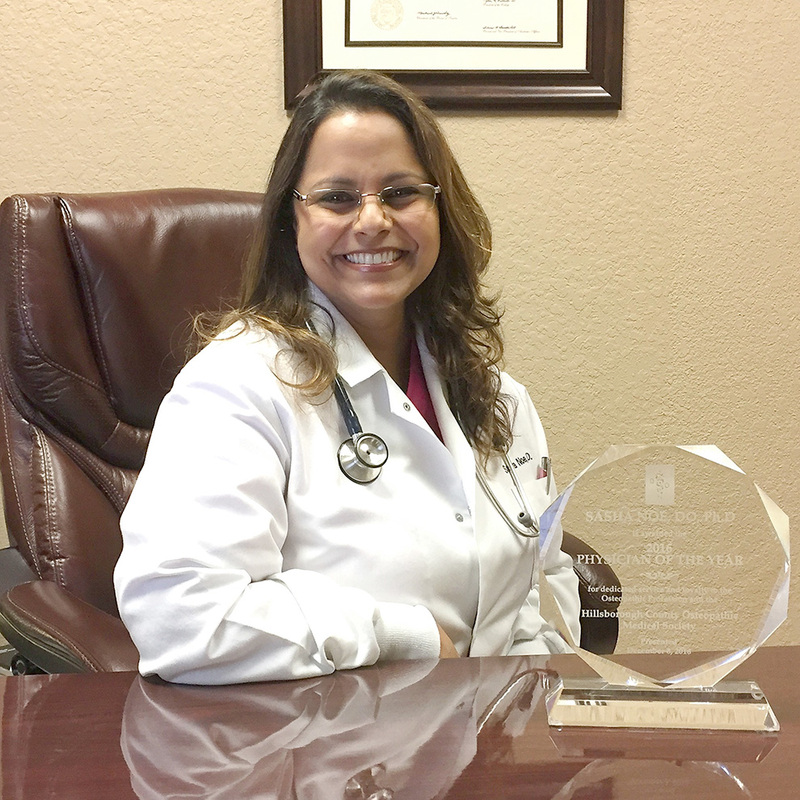 Noe is currently the president of the Hillsborough County Osteopathic Medical Society, where she was recently voted by her peers as the 2016 Physician of the Year. She will continue as the organization’s president through 2017. She has been a member of HOPE worldwide for more than 20 years and is a current member of its Tampa chapter board of advisors. She also serves on the board of Hillsborough County Osteopathic Medical Society and the Public Relations Committee for the American College of Osteopathic Physicians. Noe lives in Apollo Beach with her husband and two children. Office hours at Apollo Beach Family Medical Center — Direct Family Care, 6150 U.S. 41 N., are 8:30 a.m. to 4:30 p.m. Monday through Thursday and 8:30 a.m. to noon Friday. For more information on Direct Family Care, visit directfamilycare.com, e-mail info@directfamilycare.com, or call 813-641-0007.